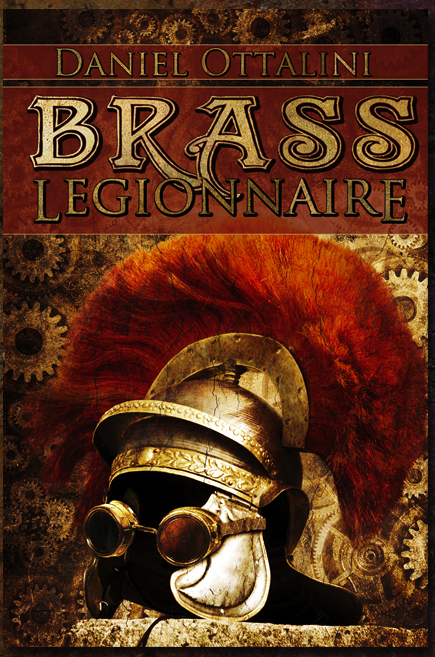 Brass Legionnaire is the first book in the Steam Empire Chronicles Series. You can listen to the first chapter here on YouTube, or download the first chapter of Brass Legionnaire. 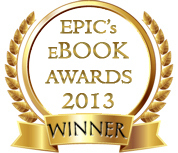 It is the recipient of the 2013 EPICon award for Best Action-Adventure Novel. An adventure story for those aged twelve to one hundred twelve, Brass Legionnaire is Daniel Ottalini’s Debut novel and available in ebook and paperback form on Amazon, Barnes and Noble, Smashwords, Apple iStore as well as most other major ebook companies and platforms. Click here for the Paperback Version! Julius Caesar narrowly avoided being assassinated during the Ides of March. The Romans were victorious in the Battle of the Teutoberg Forest, crushing their Germanic opponents and securing Germania as a province of Rome once and for all. It is 1856. The Imperial Roman Empire stretches from the Baltic Sea and the River Vistuala in the north, to the Caucuses and Red Sea in the east, to the deserts of the Sahara in the south. Roman Colonae have been founded in the New World, and Roman engineering know-how dominates Europe, Africa, and the Middle East. Only Han China in the Orient can muster such a powerful combination of strength, technology, and industry. But beneath this marble facade, there are cracks. To the north, the barbarian raiders of Nortland cobble together great airships and go a-viking, dirigible style. To the east, the Mongols hit and run style of warfare has been stopped – at great cost to the Romans. To the south, local tribes great and small are banding together around a newly emergent empire located in the heart of the Ethiopian highlands. Into this world we meet our two main characters. Julius Brutus Caesar is trying to live up to his namesake, the founding emperor, in the industrial slums of Brittenberg, an industrial powerhouse in the territory once known as Belgica. He escapes this life by joining he legions, against the wishes of his family. Newly arrived in Brittenberg, Constantine Tiberius Appius, Caesar Secondus, or second heir to the Imperial Throne, has arrived incognito as a newly minted Tribune in the XIII Germania, a fresh legion. As Constantine and Julius face the hazards and challenges of training camp, they hear of a growing insurrection in Brittenberg, one that threatens to tear out the heart of roman industry and send Rome into upheaval. With little training and no support, can the green forces of the XIII Germania save their families, their city, and the Empire itself? Or is it high time the longest lived empire in the world succumb to the forces that are trying to tear it apart? Julius – This character functions as the ‘guide’ to the world. We learn briefly about his background – a poor hardworking family where Julius must work to support both his father – an injured ex-factory worker – his mother and younger sister. Julius does not see a future in working in the factory, and a veteran says some of the right things to convince him to join the newest legion – the Germania XIII (Or XIII Germania, however you wish to call it). His father doesn’t approve, but the rest of his family supports his decision. Julius quickly discovers how tough training and life in the legions in general can be, especially in the ‘unlucky’ 13th cohort. However, he remains upbeat, especially after backing his commanding officer – Tribune Constantine Appius – during a particularly unlucky/chaotic part of training involving all the members of his cohort, a water fight turned wrong, and some obnoxious muck-racking reporters. Julius goes through more training, including mock fights and weapon drills, until his cohort is finally assigned to something new and different – a rapid response aerial cohort. (Imagine troops rappelling out of an airship and that’s essentially what it is.) On extended ‘outdoors’ training, Julius helps decrypt an emergency message alerting Constantine to the assassination of his older brother and to be wary of an attempt on his own life as well. Later, after Constantine has been returned to the safety of Brittenburg, Julius and the rest of the 13th cohort are summoned from their base camp outside the walls to save the city, which has come under attack from a combined rebel-Nortlander (read air viking) force. 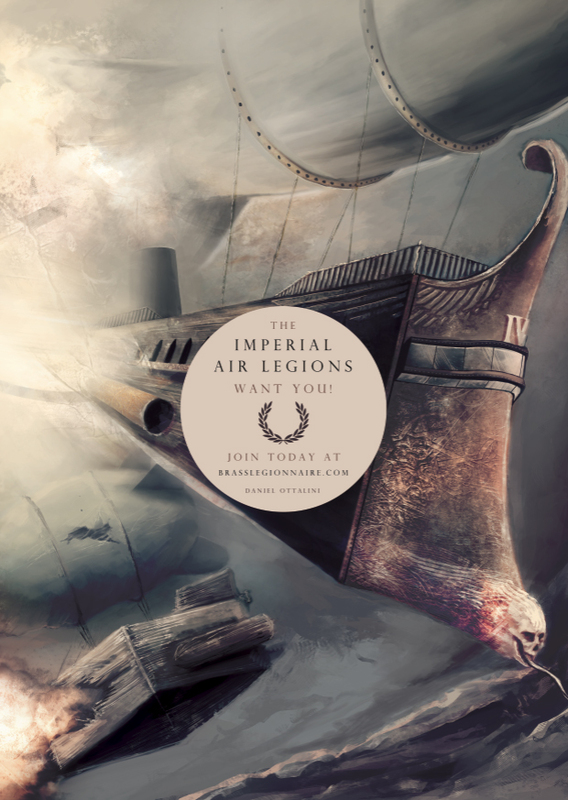 Julius, who has been temporarily promoted to a very junior officer position, finds himself in the acting Centurion position after all the commanding officers are killed in a battle between their airship and another. Julius must lead his men into combat for the 1st time, as well as performing the first ever ‘combat drop’ – he leads with skill, smart enough to listen to others, but brave enough to lead and execute, although he deals with some serious nervousness, offset by his friend and junior officer Gwendyrn. After some improvisation, Julius and his men manage to retake one of the city gates, allowing the rest of the XIII Germania into the city. Julius and his men are finally relieved, and then immediately ordered to retake additional positions to the west, now back under the command of Tribune Appius. This sets up the final ‘battle’ between the rebels, led by Corbus and his mother, Amalia, and the Romans. Constantine splits his men, sending Julius with one group to secure a landing pad atop the walls, while his men go another way. Julius and his men secure a quick victory, but then are almost immediately ambushed and nearly overrun by Corbus and Amalia. Constantine’s force comes to their rescue, and succeeds in forcing their retreat. Julius later visits an injured Constantine in the hospital, where their next mission is revealed – strike back and Nortland. Constantine – The main ‘hero’ type character. He starts out wanting to hide his heritage – he is more of a ‘let me show you what I can do and earn your respect rather than get it just because of my name’ type. Constantine suffers similar challenges as Julius, however he gets grief from both his own men, who have trouble working together at times, and his own leaders, who are alternatively sniveling, cowardly, or sycophantic. He is always under the watchful eye of Drill Instructor Vibius, who serves as both a babysitter and inspector/instructor. Eventually, Constantine is forced to reveal his secret to his men, in an effort to gain their respect and trust. It works, and the situation in the cohort improves. Later on, after more training, Constantine ends up meeting Captain Rufius Alexandros, and they form a friendship. Constantine too engages in the same activities as Julius, learning the ropes (literally and figuratively). During training, Constantine learns his brother was assassinated and his father’s life was in danger as well. He is removed from the legion and returned to Brittenburg, where he will take the next airship home. However, before that can happen, parts of the city rise in revolt with the support of some Nortland raiders. Constantine organizes a ‘last-ditch’ defense of the governor’s palace using a handful of his own men and the palace guard. They hold out against waves of rebels until the arrival of the 13th Cohort, which relieves some pressure and opens the city gates. Constantine is then ordered by his commanding officer – General Minnicus – to lead the assault against the western wall towers, which remain in enemy hands. (Why he does this is unclear – knowing the other heir is assassinated, why would you order the last remaining one into harms way? – Just remember what happened in IT!). Constantine leads the assault, splits his men up when his supporting cohort is ambushed and destroyed in order to cover more ground, and eventually ends up battling Amalia, leader of the resistance/revolt atop the city walls as she stalls to allow her son and allies to escape. Constantine cuts her down, before being knocked unconscious by an explosion. He awakes in an infirmary to learn their next mission – revenge. Corbus – Starts the story by helping destroy a Roman patrol in Brittenburg from within. We learn he is part of a conspiracy to create a free Germania from the carcass of the Roman State. This plan has obviously been set in motion for quite a while, as they have both allies near and far and have infiltrated much of the city civic guard and city gangs. Corbus and his mother meet with other supporters, where we learn more about their goals and dreams. Corbus is less ‘ideology’ minded and more ‘revenge/kill’ minded. His mother has obviously been grooming him for this roll for years. Corbus participates in various insurrection activities, such as a raid on the main Brittenburg train station, where he steals supplies and essentially destroys the entire train yard by accessing the main control room (and, of course, killing everyone along the way). During the revolt, we lose track of him until he reappears leading the rebels and supporters against the Romans. He’s coming more into conflict with the mild-insanity presented by his mother, especially as the outnumbered rebels are forced to retreat. His mother hangs back, holding off the Romans while her supporters drag Corbus onto the Nortland airship and keep him from coming to help. He watches her die, and swears vengeance against Rome for killing his mother.